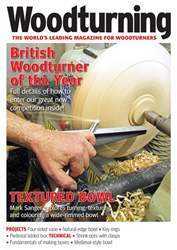 In issue 272 of Woodturning magazine we have lots for you to enjoy. 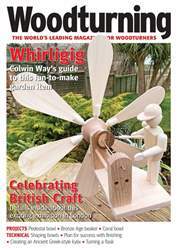 In our ‘Projects’ section, Andrew Potocnik makes a laminated serving tray; Lionel Crabbe uses multi-axis turning methods to create a paper knife and Philip Greenwood makes a desk clock and a desk calendar. 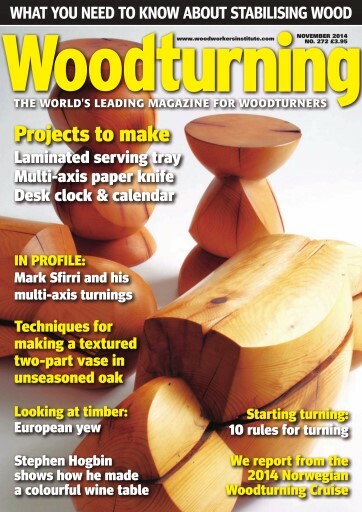 In our ‘Technical’ section, Dave Bates looks at yew; Mark Sanger takes us through the stages for making a textured two-part vase; Kurt Hertzog introduces us to the topic of stabilising wood; Richard Findley makes his box design a reality; Stephen Hogbin tells us how he made this colourful wine table and Mark Baker looks at the safety checks to make before starting to turn. 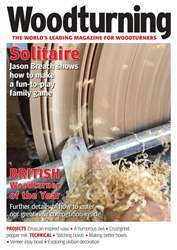 In ‘Features’, we meet Mark Sfirri and find out about his unusual multi-axis turnings; report from this year’s Norwegian Woodturning Cruise; find out more about the turning work of former engineer Paul Howard; and our Featured Artist is Laurence Brand. 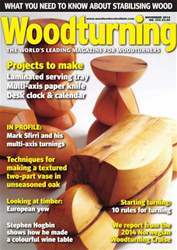 All this and more in Woodturning 272!